This is a really easy 1-ish dish meal. 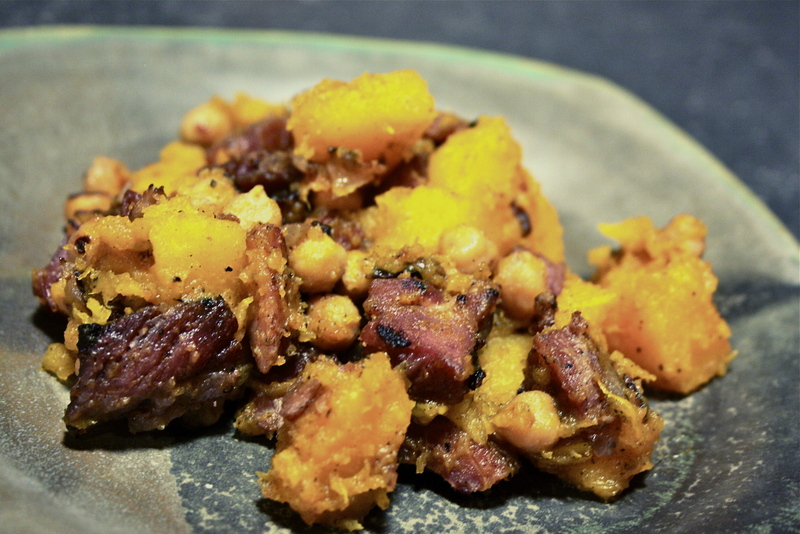 If you have already roasted squash, perfect. allow it too cool, and cube it up into 1″ pieces. In a deep cast iron pan sear off about 2 cups of thick cut smoked bacon pieces, along with 1 small yellow onion chopped into similar sized pieces and 1 cup of cooked cooled chickpeas. Toss in 1 clove of garlic chopped fine. Cook until everything is dark and caramelized. Season with: S+P, freshly ground cumin and a pinch of chili flakes. Once the bacon and onions are dark and cooked remove from pan. Add a tbsp of pork lard (if you render your own) or bacon grease, once it’s melted place your cooked, cooled squash into the pan and over a medium high heat allow the first side to sear completely before tossing. When enough of your squash is seared (and still holding together, so as not to mash the lot) add back in your bacon and chickpea mix. Just before serving add a tiny drizzle of maple syrup if you like and serve with a crisp winter salad. Made this last night – thought there would be leftovers for my lunch – no such luck!